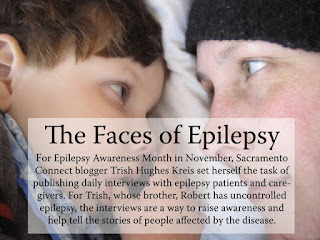 The Sacramento Bee created a gallery called “The Faces of Epilepsy” based on some of the interviews done here during Epilepsy Awareness Month. This thrills me no end since you’ve heard me say I cannot let Epilepsy Awareness be confined to one month. This point was driven home repeatedly throughout November when people would apologize profusely for not being able to participate in the interviews. Because they were dealing with the after effects of seizures. Or their child was having breakthrough seizures. Or there were medication issues that needed to be resolved. Epilepsy does not care what month it is and seizures do not care what a person is doing. Just this weekend, Robert had a few seizures while in the bathroom getting changed. I try to balance his need for privacy and independence with keeping an eye on him at all times so he is safe. During one seizure, I caught him so he didn’t fall but the other time, I was giving him privacy and he fell against the toilet, giving himself a pretty good raspberry on his back. Maybe the unpredictable nature of epilepsy makes me admire those dealing with it all the more. These people have strength, resilience, persistence and guts. And they all have to have plans and back up plans and the ability to throw all plans out the window at a moment’s notice. I am so grateful to everyone who participated in the interviews in November and I learned more than I ever could have imagined from each and every one of them. I’ve gained new friends as well as fellow advocates in our fight against the stigma of epilepsy, in our fight for more education and awareness as well as funding of epilepsy research. If you have an epilepsy story to share, I want to hear it. Please email me at robertssister@att.net and I will tell your story. Your story is important in the fight for epilepsy awareness, education and funding.